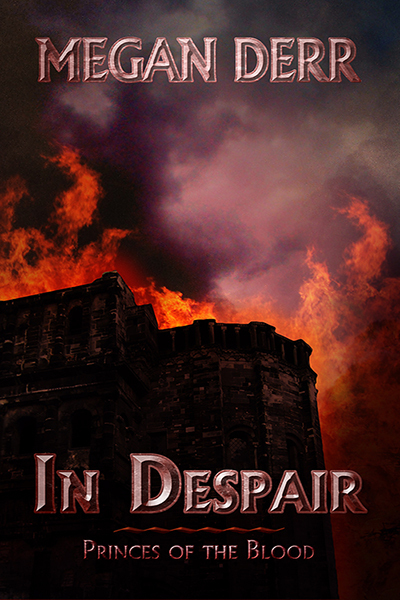 In Despair ends the Princes of the Blood trilogy that started with Of Last Resort. The story opens in “present” time – which gives readers the state of continuity after the event that happened in the first book. Korin is in a deep coma and Telmé has pretty much stepped down from his position as Commander of the Legion to take care of his husband. Then the story moves backward to where Telmé and Korin were still in their teens, the beginning of their life-long relationship. I still have the same issues I had with the previous two books – namely that I feel the world-building and the explanations stay firmly in the author’s head. Oh, I know more about Princes of the Blood now, including their Bloodling ritual. However, the other branches are still blurry to me – although I think Ms. Derr gives few explanations about Titans and Shadowmarch. This is my main issue with this series, that it being some sort of fantasy, I still end up not knowing much about it. My other issue here is the age of the main characters. Being so young – Telmé is 17 years old while Korin is 15 years old – the story is filled with teenaged melodrama and angst. Including the fighting, the jealousy, the crying… I am not opposed to characters shedding tears but I can’t say I have patience for it either. These characters feel young and act young. Also, the mystery is rather weak. There is no big twist about the villains since the crumbs that Ms. Derr gave are plenty. Having said that, I still think it’s a good read. When Telmé and Korin are not fighting, when they finally realize that they don’t actually hate each other, when they realize what they feel for one another, those moments are a treasure. I love their conversation at those times. Even if in most of the book, Telmé and Korin are pretty much separated – with Telmé going out to kill monsters after being the sole Princes of the Blood. In addition, the opening and ending the story in ‘present’ state gives readers closure. I love those two chapters, it is a testament of how strong Telmé and Korin’s love is, after twenty seven years. It also reminds me slightly of a similar plot I read in a historical M/F long time ago when I was younger, where the heroine was determined to be with her husband who was in a coma. All in all, it is a good ending of the trilogy even if the trilogy itself is not my favorite from Ms. Derr. This entry was posted on July 17, 2014 by Ami in Fantasy / Fairy Tale, PNR / UF / SF / DYS, Reviewer: Ami and tagged 3.5 Stars, less than three, megan derr.